Do you want to investigate teaching and learning in your classroom? Gain the resources you need to conduct and publish Biology Education Research. Join the Community College Biology Instructor Network to support Inquiry into Teaching and Education Scholarship. CC Bio INSITES is an NSF-funded network that aims to increase and support community college instructors' investigations into teaching and learning biology. The network consists of Biology Education Researchers at two and four-year institutions who come together to discuss and improve community college scholarship and teaching in biology. 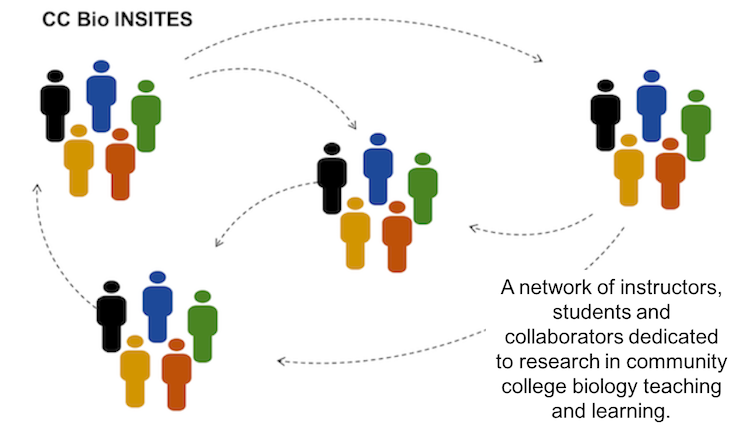 This network grew out of the recognized need for more research on how students learn biology at community colleges, which serve over half of the nations biology majors and the majority of underrepresented students in biology, and recognition of the need for increased social, intellectual, and resource support for these efforts. Are you going to SABER? If so, we invite you to meet with the CC BER Interest Group. Contact Jeff Schinske Biology Instructor Foothill College for more information.